CQ politics defines this as "MapQuest for political junkies." It's really cool. 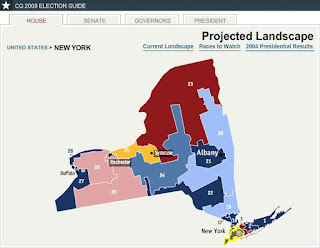 Just click the photo ... and it will take you to CQ Politics, where you can click anywhere on the interactive map and see what they expect to happen in any congressional district. For example, in my district, NY's 26th, it mentions the departure of Reynolds, the major players in the district, etc. It lists is as "leaning Republican."